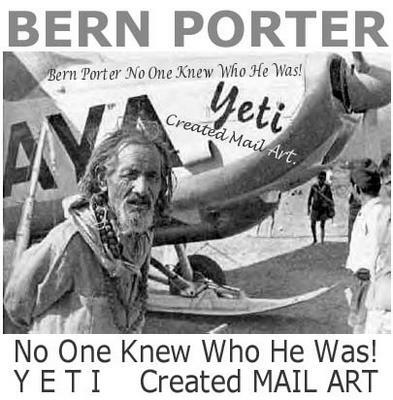 mail-interview with Bern Porter – USA – iuoma.org – Interested in Mail-Art? RJ : Why November 11th 1913? What happened on that day that you decided to start to send out mail art? RJ : Ray answered “Being myself”. So, who was Ray? I would like to know. I maintain at a library here “The Bern Porter Collection of Contemporary Letters” and wish to have the complete set of everything you have ever done. Advise cost delivered to me U.S.A. B.P U.S. Dollars in bankcheck form. RJ : “Everything I ever have done?” That is difficult. Because all the mail art I sent out isn’t mine anymore. All I produce is sent out into the network and I only have spare issues of magazines and copies of some pieces of mail. Everything I received and kept so far, that is something I have. Are all the letters you get (like e.g. this one) going to be part of “The Bern Porter Collection of Contemporary Letters”, or is is just a “part of your life” that forms this collection? Just currious, what is in the collection?